Get information on the city of Kushinagar, places of tourist attractions, tour packages, How to Reach Kushinagar and tourist attractions in and around Kushinagar. Geographically, Kushinagar is situated in Uttar Pradesh and is an important site for the Buddhist pilgrims. Kushinagar is the place where Lord Buddha died and attained salvation. The small town of Kushinagar is spread over an area of 6 kilometers, at a distance of 55 kilometers from Gorakhpur, which is an important city in Uttar Pradesh. This town stands on the bank of the river Hiranyavati. Earlier, during the time when the Buddha came to Kushinagar, the town was ruled by the Mallas. Kushinagar in Uttar Pradesh is visited by a large number of Buddhist pilgrims. The serenity and the tranquility of the place fill one with the feeling of peace and devotion in this small and beautiful city. 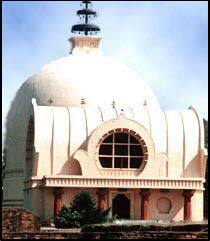 Kushinagar is most famous for the fact that this is the place of Mahaparinirvana. The city is also abounds in monuments, stupas and viharas that date back to 230 BC to 413 AD. After the death of Lord Buddha, Kushinagar town almost lost its importance as a town flocked by a number of tourists and pilgrims. The town revived its importance after General A. Cunningham and A.C.I. Carlyl, with excavations brought forward the statue of the reclining Budhha. Kushinagar in Uttar Pradesh in India can be easily reached by air, rail and road from almost all the important cities in Uttar Pradesh. It is well connected to Gorakhpur by rail and road. There are also several accommodation options that one will find in Kushinagar. Tourists can choose from the accommodation option which ranges from budget hotels to luxurious hotels. Good accommodation and developed transport system linking this small town to the whole world brings in more and more tourists everyday. Touristplacesinindia.com offers detailed information About Kushinagar in Uttar Pradesh in India. Touristplacesinindia.com also helps the tourists to get their tickets booked for a visit to this place. Touristplacesinindia.com also offers booking facilities for India Tours and travels.